This was certainly an interesting week chock full of insults. The culprits were a teenager and Equifax. Let’s start with the annoying one, the teen. A boy on our son’s baseball team visibly cringed when I told him his sneakers were phat. When I asked him what was wrong, he told me that was an insult. I went into an explanation of how it wasn’t the derogatory form spelled f-a-t, but it was the cool one, spelled p-h-a-t. Being a cool, well traveled Miamian, I thought that maybe folks in this part of Virginia weren’t hip to the “PH” deal. Yes, I was being judgmental. Apparently, I’m the one who isn’t hip. I learned, compliments of said teenager, that the word to use is actually “phresh” or even plain old “fresh”. If being told I was old isn’t insult enough, Equifax threw out a big whopper of one aimed straight for my intelligence as an unwilling customer. That’s right. I don’t want to be their customer, but I HAVE to be if I want to buy anything or even be considered for certain jobs. The offending item was not that they were the victims of the largest personal information leak in history to the tune of 143 million people. It was that they assumed I just plain stupid. And they did it several times. They offered victims of the leak a free credit monitoring account for a year. That seems like a good first step until you read the fine print in their terms which states that you agree to not sue them for being negligent. Luckily, the interwebs shamed them into adding an opt-out clause. Here is what the small print says which used to have no opt-out. My suggestion is to sign up for the free year of monitoring, which is the least they can do, and opt out of the clause. I bet you’re totally surprised by this one. Equifax Chief Financial Officer John Gamble, President of U.S. Information Solutions Joseph Loughran and President of Workforce Solutions Rodolfo Ploder all sold shares worth almost $1.8 million days after they discovered the security breach on July 29th. The hack was not disclosed until six weeks later. They all deny knowing of the hack at the time of the sale. If you believe that one, I have some oceanfront property in Idaho I’d like to sell you. Several U.S. Senators are requesting that the SEC and the DOJ investigate. Eric Schneiderman, the New York Attorney General, has opened an investigation into the hack. This is the biggest whopper of an insult, eclipsing the previous two. When you screw up and allow a breach of your customer information, and you offer them a way to check to see if they were impacted, don’t just put up fluff with no real way of checking. Thanks to the twittersphere, several folks found and shared this little faux pas where the site they used to check if your account was potentially hacked was a pure fail. I tested it out and made up several different last names and social security numbers and they all came back with positives. I wish I would have taken some screen shots. Check out this in depth look by ZDNet. 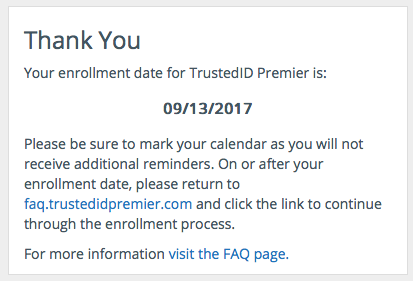 And because they are on a roll with the screw-ups, they decided to give ZERO support once you check your information and enroll in TrustedID. It’s up to you to be on top of your enrollment as they will not send you any reminders. I took a few moments to lick my wounds and rant and now it’s time for some action, because a victim I am not. I will allocate some time this weekend to making sure I’m on top of things. I will check my credit report across all agencies and making sure all is copacetic. I will be updating passwords across all banking and credit accounts and make sure I have two-factor authentication set up with them all. I will be heading over to UrbanDictionary to get woke and update my slang vocabulary. Sheesh what a week! In my day Phat was so in. The lingo changes constantly and I too get those looks from my nephews when I “try” to be cool. lol. How did I not hear about Equifax! WOW! I am speechless! I am behind the time when it comes to slang yes that makes me old. We checked to see if any of ours information was compromised. Then I found out that might not even be correct. Talk about frustration. That is awful that they sold all that stock and don’t even want to step up and support their customers. I hope everyone dumps their services. Aren’t there other credit companies out there that are better?? I don’t even know what to think about this. It has me stressed, but I guess what is done is done, and we juat have to keep an eye on our credit. Being over 50 I gave up long ago on keeping up with the lingo. It’s all I can do to keep you with all the crazy teen fashion trends. Phat was a thing in my day too, “fresh” is a never but nothing too crazy. And this thing with Equifax makes my head hurt, I hate when things aren’t just said plainly like not everyone has oodles of time to deal with this. Seriously, that was a lot to handle! What a crappy company and it’s more annoying when you see how much they DON’T care at all about their customers. At least you’re updated with the lastest slang! I don’t even know what woke means! They sold shares for almost two million dollars? I didn’t realize that, but it’s pretty indicative of being alert to their best interests. Thanks for the info! I briefly read articles about the breach but this is better than the regurgitated facts from mainstream media – Equifax’s screwups before, during, and after the breach! Wow. I’ll be checking my reports across agencies as well. I have not come across Equifax ever before. It makes me feel left behind but, nevertheless, thank you for the information. It is indeed unfortunate that people are being deceived. I will be looking into it soon. I think I keep putting it off because I am worried about the worst. I guess since you can enter anything I will come up as breached no matter what. So weird. They fixed it so that now it is a little more reliable, but I still don’t trust it. The whole is so shady! What really made me angry is that they were offering a service to monitor your credit for “free” and not disclosing that it would basically waive your right to sue them! Horrible! Yes. It was super shady. I’m glad they were shamed into offering an opt-out to that text. But it really should be an opt-in thing. Shame on them! Data breach is a major issue, this company should get fine because they screwed up! They are under investigation. I’m hoping something is done for the consumers who are the victims here. I see you are in Virginia. We are in a couple areas this week enjoying your lovely state. But not far from home – Tennessee. This Equifax thing is just scary. Yes it’s scary. Where in Virginia are you traveling? To be honest, I never used the word “phat” even when it was a thing. I’ve always been hopelessly uncool. Probably more than Equifax. Hah, I beg to differ. You are fabulously cool. And definitely cooler than them. Everyone makes mistakes and goes through unexpected trials, but it is how you handle it that defines you, not what happened. Equifax has definitely crossed the line and made things worse, rather than learning from this unfortunate situation and making things right. Agreed. They turned a PR disaster into full on meltdown. So funny but so true unfortunately. Very clever post – thanks for sharing! This is scary. I tend to just scan terms and conditions and go ahead ticking the yes box. I think I need to be careful next time.